Judith Butler asks what happens when free speech clashes with other basic values. 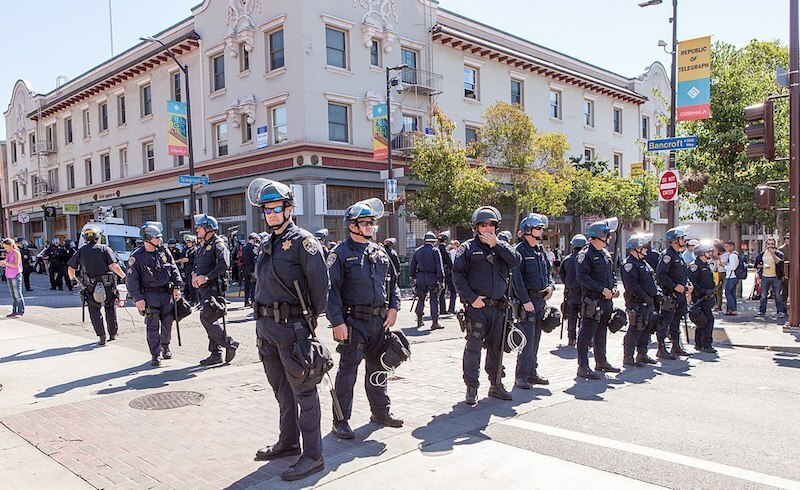 Free Speech Week: Police fill the intersection at Bancroft Way and Telegraph Avenue outside UC Berkeley. Photo: Pax Ahimsa Gethen. via Wikimedia Commons. The following is the slightly edited text of remarks Judith Butler delivered December 4 at a forum sponsored by the Berkeley Academic Senate, “Perspectives on Freedom of Expression on Campus.” It was first published at the Academe blog. Thank you for this opportunity to pose some questions that might prove useful for our discussion today. In most courses dedicated to the study of constitutional principles, it makes sense to start with cases that produce a problem for the law. What if we also start by identifying a set of quandaries not because this is a law school course, but rather because one reason the applicability of the First Amendment is not always clearly understood is precisely because it is sometimes found to be in conflict with other constitutional principles or legal statutes. In such cases, it becomes possible to ask why one constitutional principle takes precedence over another, or to ask whether there are some rather abiding dilemmas in the law that demand a certain kind of judgment. We can more easily claim what the law is than how best to judge in light of the law in any given case. And if we are part of a larger public trying to make sense of a First Amendment claim as it comes into conflict with other constitutional principles, or other basic values, then knowing what the law is does not immediately tell us how best to form a judgment of the situation at hand. I put the issue this way not to relativize the First Amendment, but only to note that its importance sometimes only becomes clear to us when it comes into a clash with other basic values. For instance, we can state that all ideas may be expressed, and that any curtailment on the expression of ideas is constitutionally unacceptable, as [Berkeley Law] Dean [Erwin] Chemerinsky asks us to do. We can agree on that in principle at the same time that we might find that certain forms of expression are ambiguous: are they, in fact, expressive activity? Are they forms of harm? Are they verbal threats? There is no way around the fact that we have to form an interpretation of what we mean by expressive activity if we want to identify expressive activity with confidence and make good on our claim that all expressive activity is permissible. We have perhaps all tired of the Milo Yiannapoulos lecture invitation that was issued by College Republicans last year (Spring, 2017). I joined a faculty letter calling for the cancellation of that talk, and I asked that the reference to hate speech be struck from the letter. To my surprise, it remained, and so too did my signature. The problem I had with his planned talk was not that he was expressing conservative ideas; the problem was that he brought cameras into his lecture hall on several occasions, and projected images of members of his audience on a screen against their will and then proceeded to shame and berate people for being fat or for being trans or, indeed, for being ugly in his view. Yiannopoulos had posted a photo of Adelaide Kramer, a trans student at the University of Wisconsin-Milwaukee, on the backdrop screen of his lecture and then not only jeered at her, but encouraged others to do the same. Perhaps shaming and berating someone against his or her will, however offensive, is protected speech as long as it does not constitute a physical threat to the person shamed and berated. But it surely does constitute harassment of the kind that all faculty and student instructors know about through the obligatory training we take in compliance with Title IX (or what is now left of Title IX). I will take up that point in a moment. There are at least two noteworthy dimensions of this story. One has to do with the use of cameras or “trigger cams” that project images of audience members against their will and the direct appeal to those watching or present to mock, harass, or troll that person and to flood that person’s email with insult. This is a question: is it right to say that the First Amendment comes into conflict with anti-harassment protocols that we learned ought to be honored in the classroom and in all forms of social interaction with students. And further, how does the invocation of the First Amendment also go against the core values of the university, ones that are time and again invoked to encourage us to engage in thoughtful conversation about controversial issues? Let me take each of these issues separately, and then make a final remark. The projection of the image of Adelaide Kramer was not done with her consent, and the appeal to audience members and those watching online to flood the email, expose personal information, and invade privacy seemed to many of us a problem. What do we call what happened to Adelaide Kramer at Milwaukee, the trans student who found her image projected on the wall during the event, and then witnessed “in frozen terror” — her words — as the speaker incited the audience to harass her. So I use the word “harassment” and so, too, did President Mone of the University of Wisconsin-Milwaukee. Maybe we shrug our shoulders and say that this is expressive activity, but surely it crosses the line between expressive activity and threat; and that line was crossed in a new way — and is crossed all the time now in new ways — because of the way technology is now used to incite people to engage in cyber-bullying that did not exist before. So the legal vocabulary we have for distinguishing expressive activity from actual threats, or an incitement to engage in illegal activity – those latter two are not protected as expressive freedoms under the First Amendment – changes when new technologies, or new uses of technology, produce new possibilities for incitement, harassment, and the commission of illegal activities. We have to come up with new understandings of all those terms which are widely acknowledged as unprotected speech. I am not sure which conservative viewpoints were being expressed at that moment: I could try to find propositional form for those actions, but would I then be generously and speculatively reconstructing those actions as the expressions of ideas, and so drawing attention away from this very specific form of targeting that included screening the image without consent, verbal incitement to harass that person, and calls to invade that person’s privacy? One reason why in meeting with College Republicans, I and some other signatories of that letter asked whether their group could not invite someone with the same viewpoints but who would neither threaten to expose members of the audience against their will through the trigger cam nor incite harassment against targeted members of the audience or the campus community. Although all the signatories opposed the conservative ideas, only some of us opposed the talk on the basis of the ideas expressed, noting the fascism, the racism, the transphobia, even the homophobia — I will return to these. One distinguishing feature of this case, however — and one reason nobody circulated a petition against Ben Shapiro — was the use of invasive visual technology in conjunction with explicit calls to invade privacy. Some of us asked both the student group and the administration to make sure that this technology would not be used by stipulating it as a condition of the contract. Our suggestions were not taken up as far as I know. Given that the university can honor the principle of speech and still regulate the time, place, and manner of the expressive activity in question, can we perhaps understand this form of technology as part of the “manner” and so subject to regulation? Or is it the case that this form of targeting and incitement moves us out of the domain of expressive activity altogether and into a consideration of harms and/or illegal activities? It seemed at that time on this campus that the only possible way to cancel a speech contracted by a student group is to show that matters of public safety are paramount. Public safety relates to conditions of security on campus, but does that rubric really cover forms of incitement and targeting of the kind I have briefly mentioned? Of course, once it was understood that only a threat to security would stop the speech, some people opposed to the speech endeavored to produce precisely such a threat. That threat had to begin to materialize — that is, fires burning and buildings smashed — before it could be decided with clarity that a manifest threat to public security was taking place. Those of us who oppose violent tactics then asked whether we have to wait for violence to start before shutting down such an event? If we know that the violence is planned, and that it is coming, as many of us did, and as many of us communicated, why was it that only with the onset of violence did the administration gain a justification to act? For those who wish to shut down such talks, they now know that violence is the most effective means. If we have to wait for the community to be imperiled, either, say, by the violence of white nationalists or their opposition, then are we not requiring that violence in order to gain the justification to cancel an event widely predicted to become violent. Dean Erwin Chemerinsky reminded us earlier this Fall of the accepted exceptions to free speech. And incitement is one of them. Some advocates of the First Amendment — and I consider myself to be an advocate — worried that the Berkeley faculty who had signed the petition had lost touch with key constitutional principles championed by the Free Speech Movement of 1964-65. But I want to suggest first that we have a real and substantial debate before us now over what constitutes expressive activity and its limits in part because the character of expressive activity has changed with new technology, but, secondly, we have a problem as a community since we are taught that no student should ever be treated in the way that Adelaide Kramer was treated at University of Wisconsin-Milwaukee. When we take our mandatory anti-harassment course online, we learn about Title IX requirements, and so we learn about the conditions under which every student has an equal access to education, and how sexual harassment in particular can produce a hostile climate that undermines a student’s ability to complete an educational program. But we learn more, namely, that quid pro quo is unacceptable, and that it is our obligation to produce a classroom environment and a mode of engaging with students that does not involve discriminatory behavior of any kind. Although a congressional statute, Title IX is not only compatible with the Equal Protection Clause of the Constitution, but claimants are since 2009 entitled to pursue claims under both provisions. I say this because the 14th Amendment obligates us to oppose all forms of discrimination and to maintain an educational institution that embodies those values in its word and in its deed. The “Principles of Community” adopted by the University of California at Berkeley include, as you know, a commitment to “sustaining a safe, caring and human environment,” an affirmation of the link between diversity and excellence, and the dignity of all individuals. So what happens when by honoring freedom of expression we permit an attack on the dignity of some individuals and groups on campus? It would seem that if we place the First Amendment above all other constitutional mandates, then it is merely considered unfortunate that the dignity of those individuals was attacked, and it is accepted to be the price we must pay for free speech. And if forms of harassment occur that would be disciplined were they to happen in the classroom or between any two members of the UC Berkeley community, and they are not disciplined or proscribed because, as public speech, they are protected by the First Amendment, how then are we to understand the difference between the norms that govern members of the community and those that are binding on individuals invited to speak to that community? We move from one framework of legality to another, and the effect on the mind is shocking and disconcerting. And it is not just that local norms and rules clash with constitutional ones, since equal treatment is a constitutional protection as well. The “clash” between these two principles can only take place if we consider harassment and incitement to be protected speech, which, I believe, they should not be. But much depends on the terms we bring to bear on identifying expressive activity and its limits. If the commitment to free speech provisions under the First Amendment takes precedence over Title IX, the Equal Protection Clause, and the Berkeley Principles of Community, then I suppose we are being asked to understand that we will, in the name of freedom of speech, willingly allow our environment to be suffused with hatred, threats, and violence, that we will see the values we teach and to which we adhere destroyed by our commitment to free speech or, rather, to a very specific — possibly overbroad — interpretation of what constitutes expressive activity protected by that constitutional principle. Of course, if we admit that free speech is one founding principle, and that there are other founding principles as well, or those that have become historically clear to us as slavery was abolished and discrimination outlawed, we are then obligated to engage in the practice of judgment that allows us to sort these conflicting and imperative demands. Indeed, in a world of changing technology where incitement and harassment take on new forms, we are faced with hard cases, real dilemmas, the need for concrete interpretation of cases and outcomes, and informed judgments. If we are free speech absolutists, then free speech not only takes precedence over every other constitutional principle, and some argue that every other constitutional principle will be regarded as structurally dependent on the First Amendment. That is one view — a kind of domino theory — but surely not the only one. If free speech is not the only constitutional right we are obligated to defend, then we are surely in another sort of quandary, figuring out how best to defend rights that sometimes do clash with one another, and where the clash takes new forms in different moments of history when new expressive technologies force us to reconsider the meaning of expressive freedom. If free speech does take precedence over every other constitutional principle and every other community principle, then perhaps we should no longer claim to be weighing or balancing competing principles or values. We should perhaps frankly admit that we have agreed in advance to have our community sundered, racial and sexual minorities demeaned, the dignity of trans people denied, that we are, in effect, willing to be wrecked by this principle of free speech, considered more important than any other value. If so, we should be honest about the bargain we have made: we are willing to be broken by that principle, and that, yes, our commitments to dignity, equality, and non-violence will be, for better or worse, secondary. Is that how we want it to be? Is that how we must be?